G.H. Raisoni College (G.H. 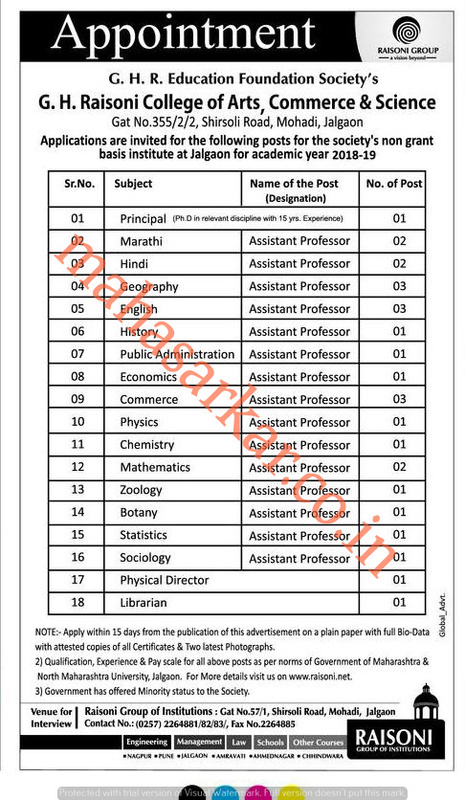 Raisoni College of Engineering & Management), Pune Published Job Notification for 74 Professor – Assistant Professor & More Posts. Candidates who wish to apply must look at G.H. Raisoni College Professor – Assistant Professor & More Recruitment 2018. Eligible candidates can apply Offline before 09-05-2018. Starting Date, Last Date to Apply Offline at G.H. Raisoni College of Engineering & Management which candidates should be remembers as follows. Last Date to Apply Offline: 09-05-2018. G.H. 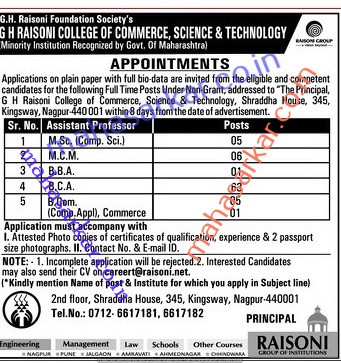 Raisoni College (G H Raisoni College of Arts, Science & Commerce), Jalgaon Published Job Notification for 18 Assistant Professor Posts. Candidates who wish to apply must look at G.H. Raisoni College Assistant Professor Recruitment 2018. Eligible candidates can apply offline before 27-02-2018. Starting Date, Last Date to Apply Offline at G H Raisoni College of Arts, Science & Commerce which candidates should be remember as follows. Start Date to Apply Offline: 13-02-2018. Last Date to Apply Offline: 27-02-2018. G.H. 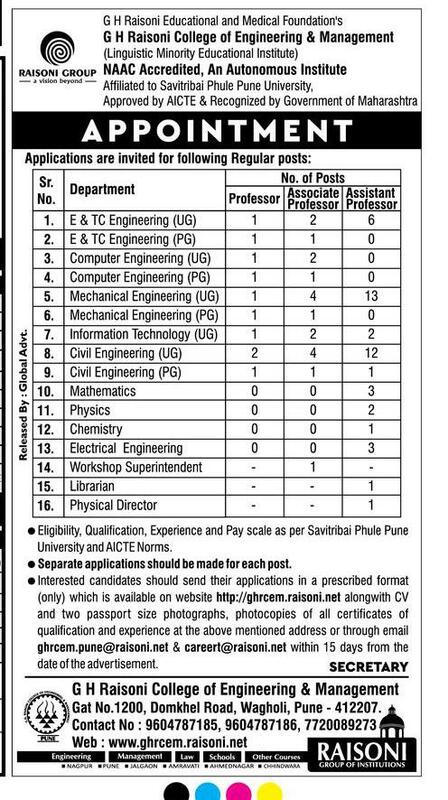 Raisoni College (G H Raisoni College of Commerce, Science & Technology), Nagpur Published Job Notification for 81 Assistant Professor Posts. Candidates who wish to apply must look at G.H. Raisoni College Assistant Professor Recruitment 2017. Eligible candidates can apply offline within 8 days from the publication. Last Date to Apply 8 days from Publication. Education Qualification: Must have Graduate/ Post Graduate/ Master Degree and More. For Post wise Education Details follow the detailed advertisement. Interested & Eligible candidates can send their application along with all the necessary documents and testimonials Email to careert@raisoni.net. Starting Date, Last Date to Apply Online at G H Raisoni College of Commerce,Science & Technology which candidates should be remember as follows. Start Date to Apply Online: 14-08-2017. Last Date to Apply Online: 8 days from publication.